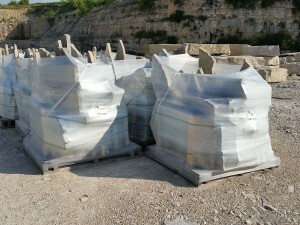 Our stone is packaged to secure and protect the product in transit. 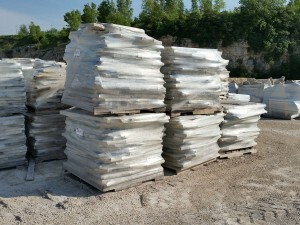 Most of our full veneer stone and landscaping products are palletized and sold by exact weight. We offer a combination of 2 ton and 1 ½ ton pallets standard. Thin Veneer is packaged in crates or small boxes. 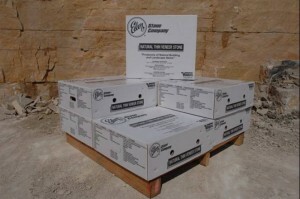 A standard crate or “Big Box” contains 120 square feet of thin veneer stone flats or 70 linear feet of thin veneer corners. Small boxes or “Handi-Paks” contain 8 square feet of thin veneer stone flats or 6 linear feet of thin veneer corners. Custom crates are built for delicate custom pieces. Special crating is highly recommended whenever your custom product ships on an LTL carrier. *Surcharges apply for special packaging requests. 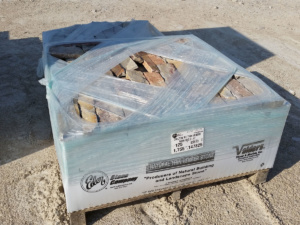 Our products are hand-packed on 1-1/2 or 2 ton pallets using styrofoam spacers to ensure that your stone will not be damaged during shipping. After the stone is packaged on the pallet, it is stretch-wrapped and banded with edge clips for extra protection. If the stone will not fit our standard pallet size of 42” x 48”, we can provide alternative packaging suggestions and solutions. Depending on the size, we may need to build a crate around the product for LTL shipping. A crate is built with 1/4″ plywood and typically 2″ x 4″ lumber. 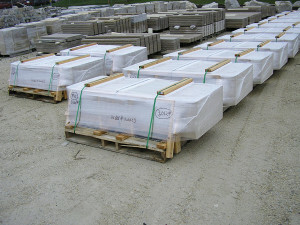 If a crate or pallet is not suitable for the size of the product, the stone will be placed on an A-frame. Upright A-frames are commonly used for transporting thin slab material. The frame work is constructed with 2″ x 4″ lumber, and the material is banded to the frame. Since packaging affects pricing and shipping costs, special packaging requirements need to be specified prior to the pricing/bidding of the project. Each individual piece of stone will have a stone mark that you can reference to your shop tickets. These will also appear on the Bill of Lading you will receive at the time of delivery.